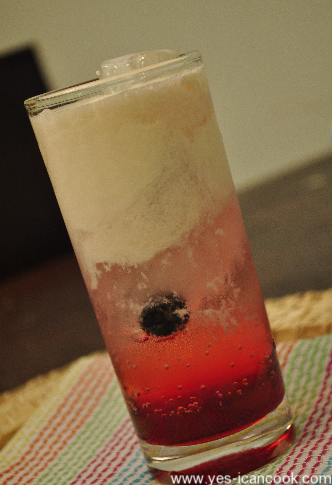 Aaaahhhh.. so refreshing and tasty. An easy way to please your guests for sure. 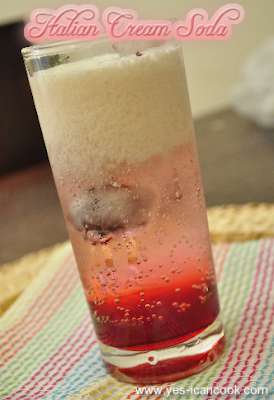 Try serving this drink to your guests the next time they visit you and make every one wonder how you made it. 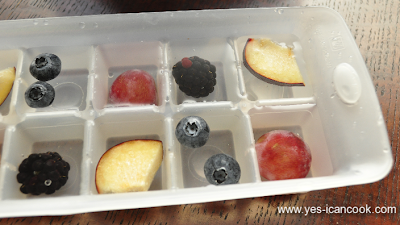 It is so easy and simple to mix up and takes hardly any time. 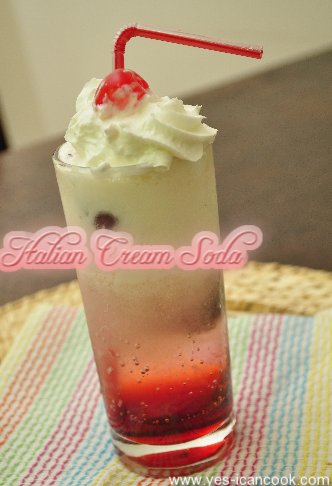 I came across this recipe for Italian Cream soda while page hopping on facebook. I immediately made a note and decided to give it a try soon. 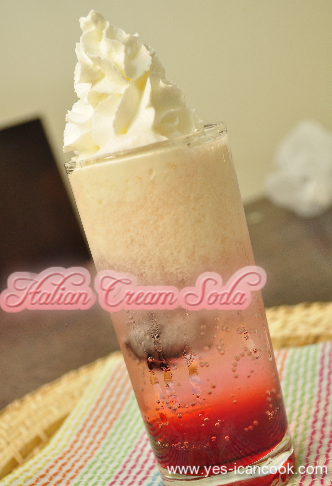 Italian soda is a drink made by mixing a carbonated drink with a flavored syrup. 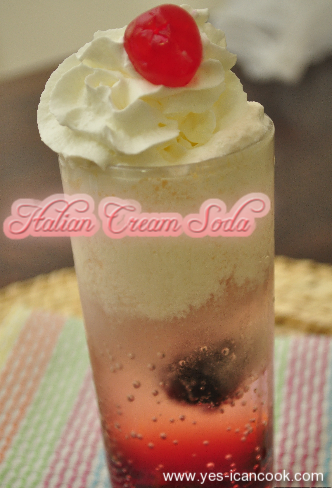 Cream is added to the Italian soda to turn it into Italian Cream Soda. 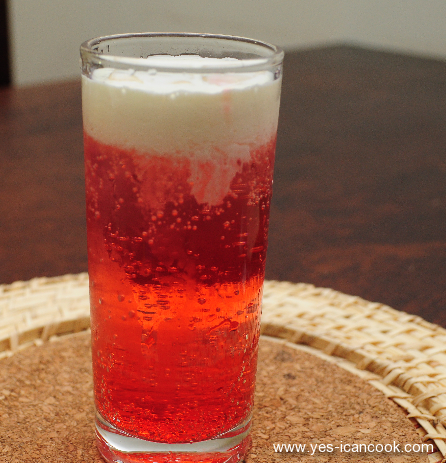 My husband very often makes Ice Cream soda or cola float by mixing vanilla ice cream with cola. He loves it. 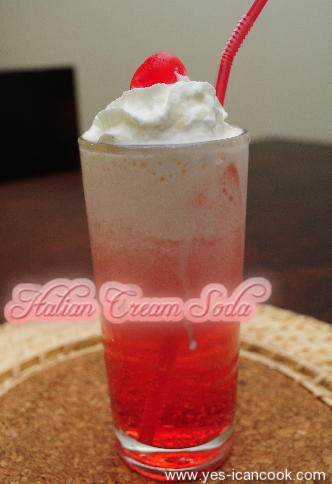 He now has added this Italian cream soda to his favorite drinks list. 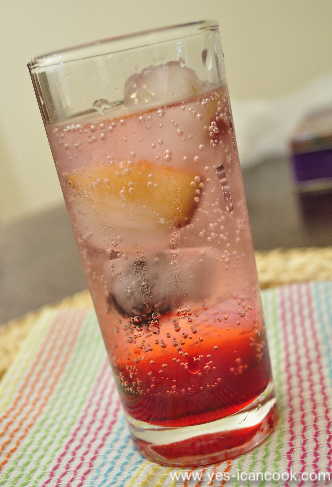 The original recipe calls for Club Soda but I substituted with Sprite. The original recipe also calls for fruit flavored syrups but I used Grenadine. You can also substitute with Rooh Afza. I am sure it will taste good. The original recipe also calls for half and half. I did not find half and half in any of the supermarkets so I made my own by mixing equal quantity of heavy whipping cream and full fat milk. 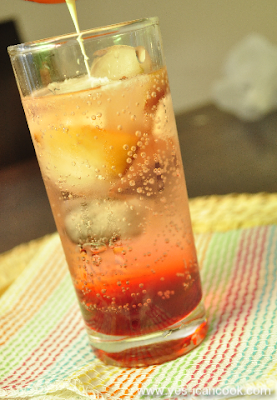 Sprite - 180ml use more or less depending on your glass size. 1. In a small mixing bowl add whipping cream and milk. Mix well to combine. This is half and half. 2. 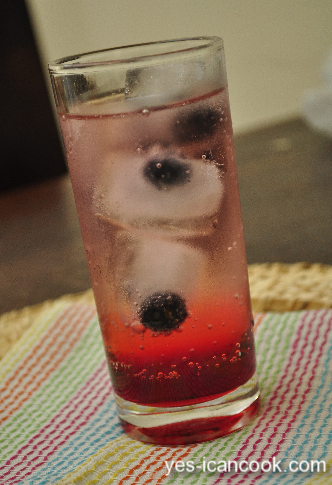 When ready to serve, In a glass you wish to serve the drink in, add ice cubes. I went fancy and made ice cubes with fruits in them. 3. Next add the sprite to fill 3/4 of the glass. 4. 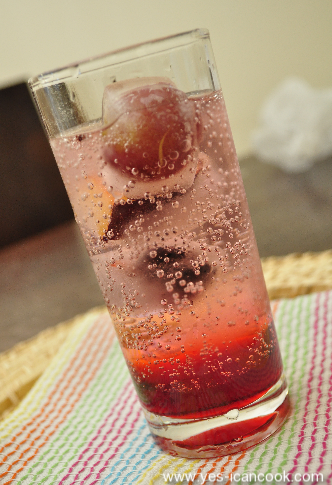 Add grenadine to the glass. 5. I made following steps 3 and 4 which is how it is originally made and I also swapped steps 3 and 4 ie by first adding the grenadine followed by sprite which makes it look even better. 6. Slowly add the prepared half and half on top to fill the glass. Add slowly as otherwise it will not stand as a separate layer and will get mixed. 7. Handle the drink carefully now till you serve. 8. Serve as is or top with whipped cream and a glazed cherry. 9. Serve with a straw. Watch the way the half and half blends when you shake the straw.